The larvae of Oplodontha are aquatic. Most species prefer marshes and the littoral zone of ponds and springs. O. viridula is halophilic and is found in near the margins of rivers and estuaries (Rozkošný 1998). Most species of Oplodontha are native to Africa, with a few found in Southeast Asia. O. viridula is found throughout Europe and Western Asia. O. luzonensis is native to the Philippines. O. rubrithorax can be found as far east as the Ryukyu Islands (Japan) (Woodley 2001). Oplodontha is distinguished from other Palaearctic Stratiomyini by the fusion of R1 and R2+3, the very small discal cell, and the scape no more than twice as long as the pedicel (Rozkošný 1998). Rozkošný, R. 1998. Chapter 24. Family Stratiomyidae. Manual Palaearct. Dipt. 2:387-411. Diptera.info. 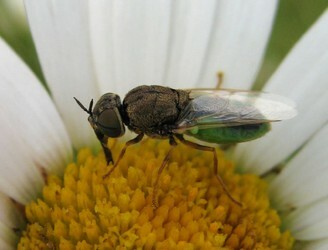 Image of female Oplodontha viridula.